15 September 2010 by J.M. We are excited to see IE9 help enable a material step forward with one of the most important experiences on Windows, browsing your favorite sites. In a first test run, I quite liked the speed that Internet Explorer now has. It is possible to load new tabs without noticeable delay, to navigate in web pages... — all without that old-fashioned feeling saying “IE is slow as usually.” The browser’s startup time is simply amazing. Also, when a browser add-on might slow down the IE launch, you are notified and can disable the corresponding add-on to keep IE speedy. The installation wizard also got much simpler (yet takes as long as IE8). 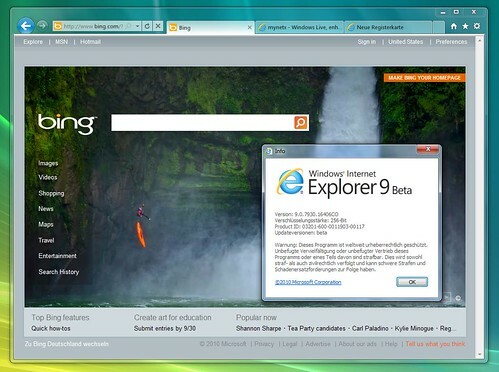 Overall, IE9 decreases the hole between Microsoft and the current browsers Firefox 4 Beta, Safari 5 and Chrome 6. Meet the new IE and get your own opinion!